Here is an explanation of what MailChimp is and how you can integrate your MailChimp account with Storman. For more information on how or why you would want to integrate and start using MailChimp for your marketing and customer surveys, please read this article. 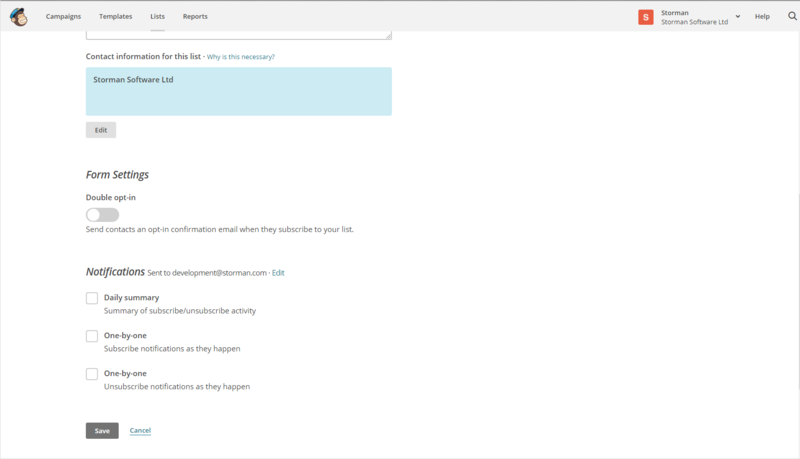 For more information on how to create a Drip Campaign mailing list for Storman to continuously add moved out storers to, please read this article. Step 1: What is MailChimp? 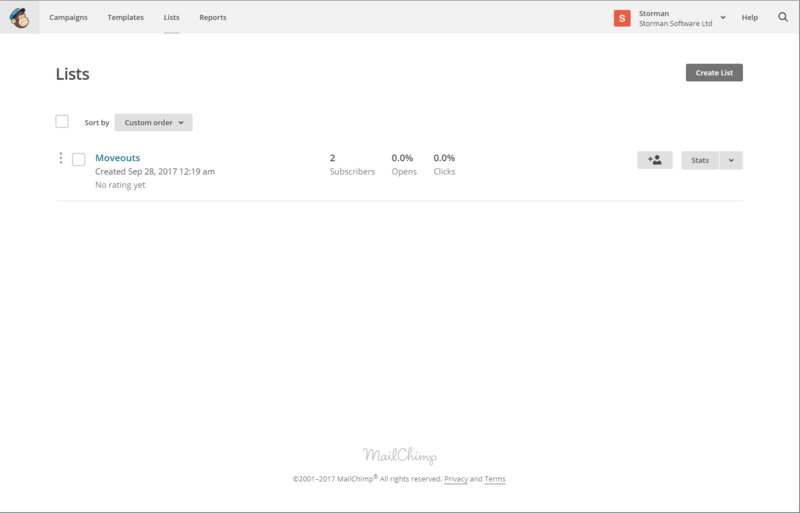 Step 2: How do I get started with MailChimp? Step 3: How do I get an API Key? 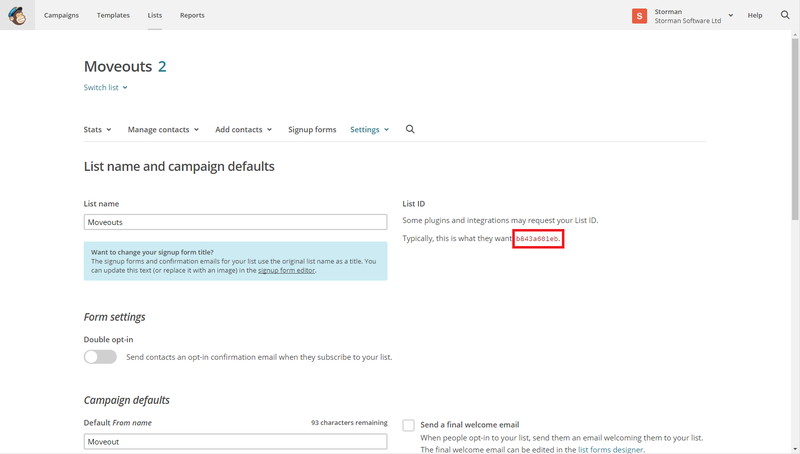 Step 4: How do I create a MoveOut list in MailChimp? 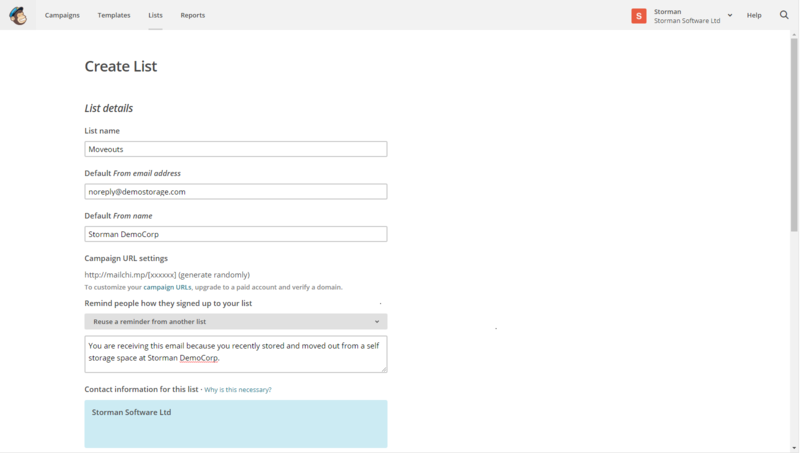 Step 5: How do I setup Storman for MailChimp? Step 6: Storman is building up my moveout list, what now? 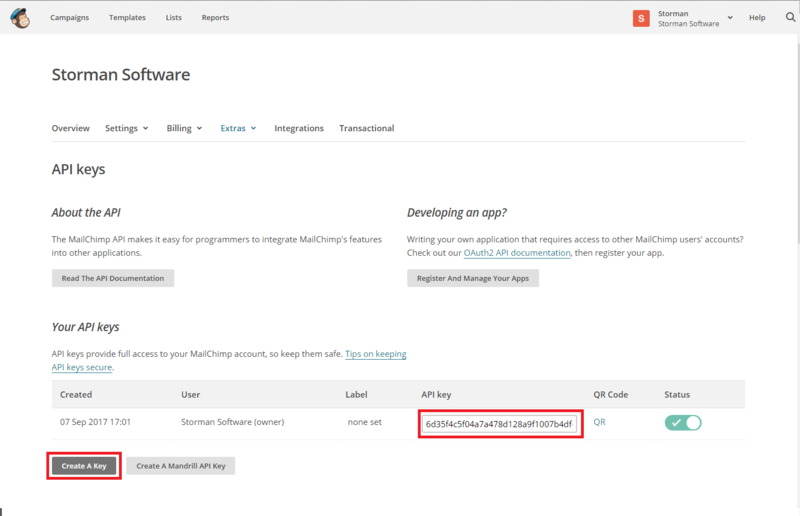 To be able to integrate Storman with MailChimp, you will need a MailChimp account. 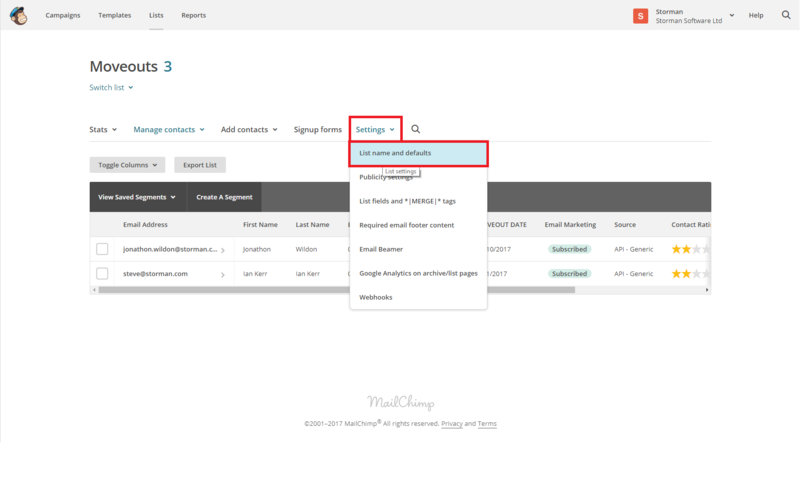 Once you have signed up for a MailChimp account, you will need to generate an API key. This key will then need to be loaded into Storman, to be able to send your storer email addresses to MailChimp. 1. Click on your account menu, and click on profile. 3. If there are no API keys present, you will need to Create a Key. 4. Once you have created a key, copy the key into a word or notepad document for use later on. 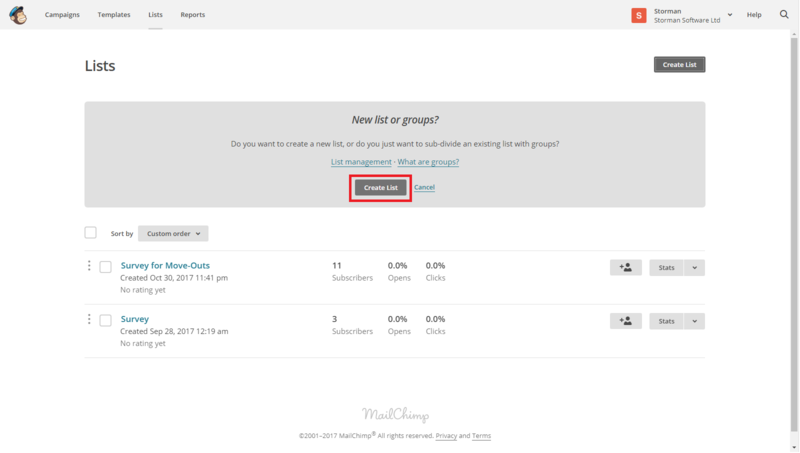 How do I create a MoveOut list in MailChimp? 1. Login to your MailChimp account and navigate to Lists. 2. Here you will find any lists that you have previously created, if there are none use the bottom in the top right to create one. In the below example we are creating a list called moveouts. This is the email address that emails sent from MailChimp will come from. This should be either a 'noreply' or your mail facility email address. In order for anyone replying to the emails to come to you. You are receiving this em ail because you recently stored with and moved out of a self storage space at Storman DemoCorp. This is a small note at the bottom of every email sent from MailChimp, letting your storers know why or how they have received this. To avoid them thinking it is spam. This is an option to send an email to your storer, at the same time Storman sends them to this list. Here you have the option to receive notifications each time a user is subscribed to the list. 4. This list is now ready to be populated by Storman. How do I setup Storman for MailChimp? Once you have your list created and an API key, these details will need to be loaded into Storman. 1. Open your newly created list, and click on Settings > List name and default. 2. Make a note of the List ID on the right hand side, this is the unique ID for this mailing list. 3. From your Storman dashboard, navigate to Maintenance > System Setup. 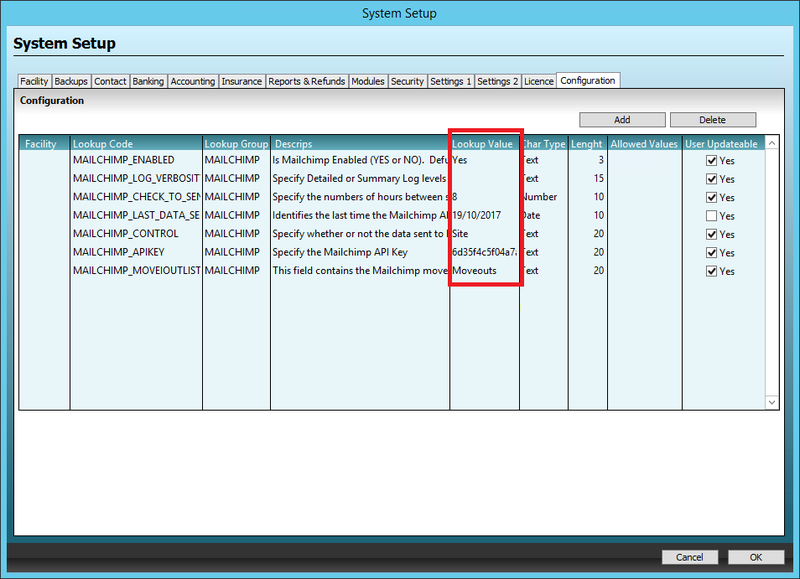 Under the Configuration table you will find the below table. 4. Click the add button to create new records. 5. 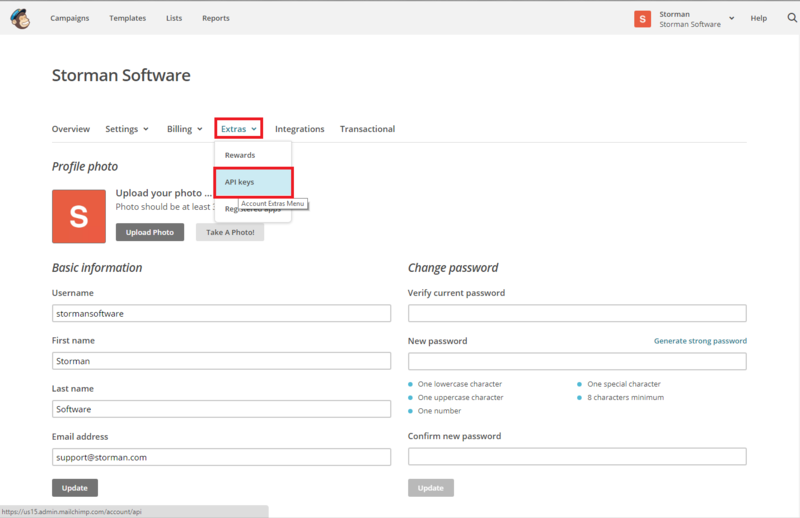 In the below table, you will need to define the settings required for Storman to send email addresses to MailChimp. Please fill in the Lookup Value column for each of the following. 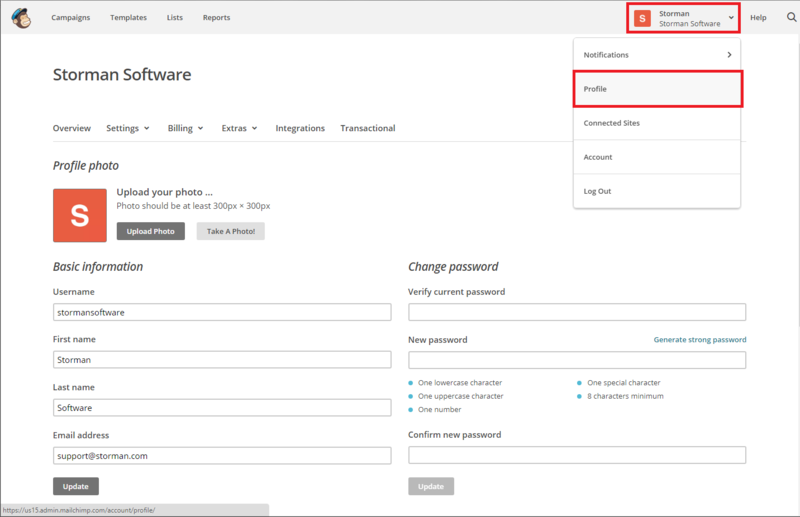 The below settings are recommended for Storman to check one a day for any new moveouts, and send them to the MailChimp list we created earlier. If yes Storman will send storer information to MailChimp. If no Storman will not send any information. The number of hours for Storman to check for new moveouts and send the storer information to MailChimp. Storman will always check for moveouts from the day before, we recommend setting this as the same date that you setup MailChimp. To pick up any moveouts from yesterday and then the same day going forward. We recommend setting this as Site. The API key for your MailChimp account. The List ID for your moveout list. Storman is building up my moveout list, what now? Storman will continue to build your moveout list by automatically subscribing moved out storers, until you wish to turn it off. This article below explains the best way to create a "Drip Campaign" for sending surveys to storers.